Drinking a glass of red wine should help you relax, but if you have certain medical conditions, consuming the alcoholic beverage may cause pain throughout your body. 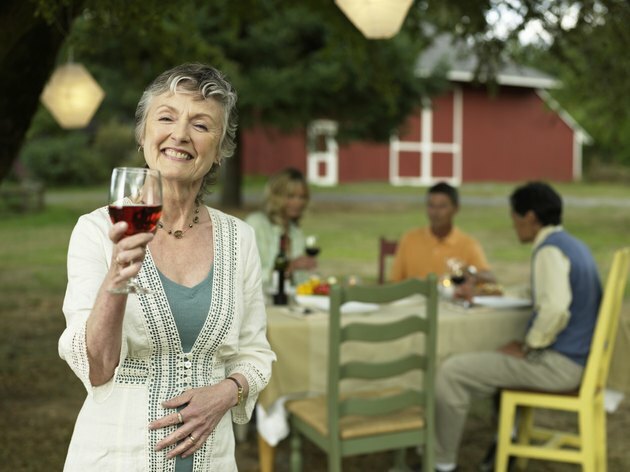 Red wine is high in histamine and sulfites, which can trigger systematic reactions. An allergic reaction may also cause pain in various parts of the body shortly after someone drinks the beverage. If you have a painful reaction, avoid drinking red wine until you consult your doctor. Histamine is a naturally occurring hormone in the body that helps to protect against infections, but it can cause problems throughout the body when produced in excess. Some foods containing histamine can trigger allergy-like symptoms. Red wine and beer are considered high-histamine beverages by the British Allergy Association. If you're histamine intolerant, drinking red wine may cause pain in your head, abdomen, skin, eyes, throat and chest. When you drink red wine, the extra histamine can cause your blood vessels to dilate, which leads to swelling and inflammation in soft tissues. Some people may develop an allergic reaction after drinking certain alcoholic beverages. A diagnosis of an allergic reaction requires proof that the body is creating immunoglobulin E antibodies when red wine is introduced into the body. An allergic reaction is an overreaction that causes the immune system to defend the body from the otherwise harmless substance. Instead of allowing red wine to go through normal digestion, the body reacts as if it is under attack from an infectious organism. Sulfites are commonly found in red wine. This can cause pain throughout the body if you have sulfite sensitivity. Sulfites are chemicals used in some foods and beverages as a preservative. They were banned from use in fruits and vegetables in 1986, but are still permitted in alcoholic beverages. A severe reaction to sulfites can cause pain in the chest, along with chest tightness, shortness of breath and wheezing. All of these conditions could possibly trigger anaphylaxis. Anaphylaxis is a severe reaction that affects the entire body. If anaphylaxis is not treated, it can lead to serious complications or be fatal. During anaphylaxis, your blood vessels dilate to an unhealthy size, causing a drop in blood pressure, increased heart rate and shock. Call 911 if you suspect that you're developing signs of anaphylaxis. A hangover occurs when you drink too much alcohol, causing your blood alcohol levels to drop significantly. Most hangover symptoms appear the next morning after you drink too much, and may include thrist, headaches, muscle aches, vomiting, poor sleep, sensitivity to light and sound, dizziness, rapid heart rate, redness in the eyes, and feeling shaky and unable to concentrate.